A Sophiatown theme and exceptional entertainment set the tone at Sun International’s The Maslow Hotel, when six industry stalwarts were named Lifetime Achievement Award winners and five young creatives were recognised for their talent at the 19th annual Arts & Culture Trust (ACT) Awards. At the core of the Awards, is the announcement of Lifetime Achievement recipients who have each had a lifelong commitment to the arts, and this year, six deserving luminaries were recognised. The recipients are nominated by the ACT Board of Trustees and selected by current and previous ACT Trustees. Categories include: Theatre, Music, Visual Art, Literature, Arts Advocacy and Dance. 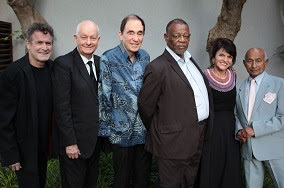 This year, ACT honoured Pieter-Dirk Uys for Theatre, Johnny Clegg for Music, Penny Siopis for Visual Art, Dr Mongane Wally Serote for Literature, Albie Sachs for Arts Advocacy and Johaar Mosaval for Dance. The ImpACT Awards for young professionals are given annually to honour young artists or businesses that have reached a notable level in their career. Giving the masses a voice through the public nomination process, ACT proudly boasts a first-rate selection of these individuals in the categories of Theatre, Visual Art, Music, Dance and Design. Visual artist Chepape Makgato; singer Thandi Ntuli; actor Mkhululi Z Mabija; designer Jody Paulsen; and dancer Sunnyboy Motau were named the 2016 ImpACT Award winners. Each boasting a bourgeoning creative career, this year’s winners collectively represent determination, dedication and ineffable talent. The 2016 Awards saw ACT partner with the Distell Foundation, The National Lotteries Commission (NLC) and Sun International to see this group of young professionals being lauded for the remarkable impression they have made in the first five years of their careers. Each winner will receive R10,000 and additional PR opportunities that will be generated through the ACT Awards. ImpACT Award recipients will also get on-going backing from ACT in the form promotional support in their professional careers. The 19th annual ACT Awards was hosted by Sun International in association with the National Lotteries Commission (NLC), and supported by Business and Arts South Africa (BASA). The Southern African Music Rights Organisation (SAMRO) sponsors the Lifetime Award for Music, the Dramatic, Artistic and Literary Rights Organisation (DALRO) for Theatre, Media24 Books for Literature, the Nedbank Arts Affinity for Visual Art, JTI for Dance and Creative Feel for Arts Advocacy, which will see recipients each receiving R45,000. For more information about the Arts & Culture Trust (ACT) visit www.act.org.za and use the hashtag #ACTAwards across all social media channels.